I wrote about watches from Ecclilssi earlier this summer, so I went over again recently to take a look at their jewelry. While I was a tad disappointed not to see more jewelry on the web site, I did find a few interesting pieces made from 14 karat gold and agate. The term dendrite comes from the Greek word "dendron", which means a tree. This description is appropriate because we often describe the form and structure of a metallic dendrite as that of a tree with a main branch or trunk, from which grow side branches, from which grow smaller side branches, and so on. I hadn't been over the the Blue Piranha jewelry site in awhile, so I decided it was past time to see what jewelry designer, Jill Sharp was up to. 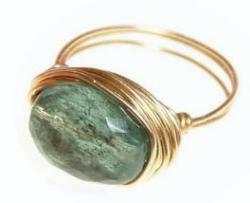 I'm always happy to see how she finds a way to combine wonderful gemstones with metal. Pictured left is one of her necklace designs, which she calls Kenia. I like how she has a "name" for each piece, especially consider she makes so many limited edition designs. She calls these earrings, Madison: Hand-shaped sterling links gracefully dangle apatite, pink tourmaline, and blue topaz briolettes. These are called Rydell: Polished silver diamonds are framed in sterling curb chain, and accentuated by the glowing jewel tones of pink tourmaline and tanzanite. Though Jill seems to be more of an earring and necklace designer, she does have a few amazing bracelets like this one made out of tons and tons of tiny sterling jump rings! Colored Topaz is a new high-tech gem available in an amazing array of colors, including gems that show many colors at once. This beautiful natural topaz is enhanced by the gem cutter's art and a touch of rocket science: high-tech physical vapor deposition of a metallic layer which creates amazingly vivid tones. The coloring is durable and will last for years with proper care. 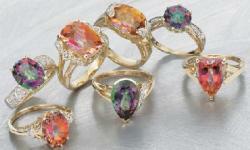 Colored Topaz is available in an amazing palette of fashionable colors. Blues that echo the ocean and sky. Greens that are as lush as the fields and forest. Yellows of the sun and sunset skies. pinks of tropical blooms and delicate blossoms. Purples of the twilight skies. Add more color to your life with this gem that matches your every mood. 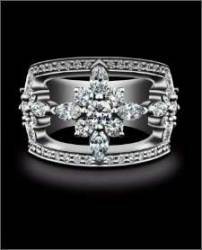 Manak Jewels Inc. has been in business over 25 years serving customers nationwide and abroad. The company was started back in 1975 by a husband and wife team. Since then, the founder of Manak Jewels has grown the company to become a leader in natural fancy color diamonds and a supplier of fine designer jewelry – the Manak Couture Collection. Today Manak Jewels continues to thrive and succeed in the diamond and jewelry industry with high quality standards, superior customer service, and commitment to integrity. Manak Jewels headquarters is located at the Jewelry Center in San Francisco, California. The manufacturing units and export houses are in Bombay and Jaipur, India. Since inception, the team at Manak Jewels has dedicated themselves in developing new concepts in gemstone design by pioneering the use of Diamond Briolettes, Beads, Old Mine Cuts and Rose Cut Diamonds for fine jewelry designers in the trade. First, I apologize for not figuring out a way to get the full picture of this. I just couldn't get a full screen capture of it, or any of the other way cool…not sure what to call them….gemstone paintings? What about gemstone mosaics? Whatever they are, I found them over at Vogue Gioiello web site. The title of the unusual gemstone exhibit they provide is called "Traveling the Jewelry World 2007," and as you click through each screen, you enjoy a wonderful array of gemstones that are arranged in designs to sort of make them look like people or animals. 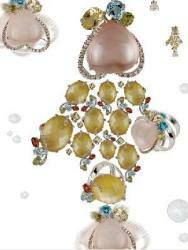 Diamonds, pearls, all kinds of gemstones and jewelry pieces are arranged and then photographed. Happy Mothers' Day to all those moms out there. I hope you received some special jewelry gifties today. You totally deserve them. If you gaze deep into a crystal ball, you will see a versatile gemstone, one of the most popular gems on earth. Beautiful quartz, the 'rock crystal' used in ancient times to make crystal balls and bowls, is today more often seen set in gold jewellery. Despite the popularity of quartz gems like amethyst, citrine, ametrine, rose quartz, onyx, agates, chrysoprase, rutilated quartz and other varieties, many people in the jewellery industry take quartz for granted because of its affordable price. Throughout history, quartz has been the common chameleon of gemstones, standing in for more expensive gemstones ranging from diamond to jade. But the incredible variety of quartz is now beginning to be appreciated in its own right. One of the most popular consumer-based web sites for diamonds, A Diamond is Forever, is now promoting the idea that the diamond ring is not meant only for the left hand – as in the finger you wear your wedding ring on – but that they are also very suitable for the right hand as well. Women of the world are celebrating the Diamond Right Hand Ring! Blend your distinct love of design with your passion and desire for eternal style. The Diamond Right Hand Ring is the perfect piece of diamond jewelry to reveal your unique personality. So take the Ring True Test to find the ring that reflects you best. With so many styles and designs to choose from, the options are nearly as irresistible as you are. While I don't buy that this is some world-wide trend, per say, I do like their ring styles. I would actually like to see some of these same designs with colored stones, such as some yummy rubies. Back in the late 80s when I first started seriously making and selling my own jewelry, crystals were all the rage. I sold those puppies like not cakes. The whole "new age" era was hot, so crystals were the cool jewelry component – especially when it came to earrings and pendants. I guess what was old is new again, but with an added twist as Uearthen jewelry has fused, literally, nature and man in this unusual pendant, part crystal and part bullet. Designer Gia Bahm bids you to choose wisely. Just as she takes her time harmonizing the history and opposing forces that define her new line, Unearthen, so should you consider the distinct powers and potential in each of her crystal creations. The design of Unearthen necklaces centers around a stark and potent union between the bullet and the crystal. Violence and destruction meet restoration and creation in pieces that recognize the dramatic struggles and conflicts of everyday living, and, in turn, offer a source of strength and protection. Which, of course, linked me over to the Unearthen web site. Whew, seemed like it wasn't gonna happen there for a while but I finally started the next collection and finished it with a photo shoot yesterday. I kept the collection small since I tend to overwhelm people with choices. It was a bit of teeth pulling at first working on new designs but I was surprised to find myself right back in the 'love' of it before long. This should last for the next few months while I pursue the skills I need to work on what I think I want to do. 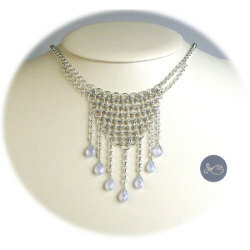 Along with her email, Anne Maa has offered a discount to readers of The Jewelry Weblog good until 3/31/07. That's right! To get 15% off any purchase on Anne Maa Designs, simple include the code "jewelry" when you check out. 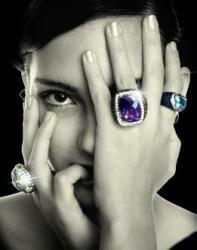 If you've been drooling over her rings and other gemstone and metal creations, now is the time to treat yourself. Here are a few more pieces from her site which include vermeil, apatite, and aquamarine. Bodyrocks Jewelry is announcing a new line of heart-themed and gemstone jewelry just in time for Valentine's Day. Actually, they are pushing it for Mother's Day, which is also coming up in the near future, but the heart charm made me think of Valentine's day. I have to give this design a thumbs up. Yes, it's simple, basic, but it is something you could wear every day, even a signature piece. Pictured above and below, it is available in various types of stone such as topaz, rose quartz, kyanite, and garnet. As Mother's Day approaches, heart-themed jewelry is the "must-have" gift. BodyRocks Jewelry introduces its new line of heart inspired necklaces. This simple, timeless necklace features a uniquely crafted sterling silver heart pendant accompanied by a rich, faceted gemstone. Adorned on an adjustable 16.5 to 18 inch sterling silver chain, this necklace is appropriately finished with a classic heart-shaped clasp. Always in style, this necklace features one of the hottest trends displayed by fashion designers during the Spring/Summer 2007 Fashion Week. Jewel tones were among the most prominent trends on the runway. Designers such as Oscar de la Renta, Valentino and Emilio Pucci incorporated rich and bold colors into their most recent collections. Similarly, this fashion forward necklace is available in a variety of semi-precious gemstones ranging from deep blues to strong reds and every shade in between. 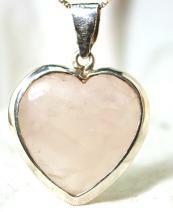 As for the hearts, it seems as if they are the perfect, evocative jewelry trend this time of the year. Hearts symbolize love and they have been spotted all over young Hollywood's "it" girls this season. Lindsay Lohan, Jessica Simpson and Mischa Barton have all been spotted wearing this Spring's newest trend. This fantastic heart necklace is the perfect accessory for the upcoming seasons. Treat the women in your life, or yourself, and share your love. Happy Mother's Day! Love, BodyRocks.